We all are familiar with these two technologies : WiFi and Bluetooth. Though, both of them are Wireless Technologies which makes use of Radio Waves and free open atmosphere as a communication channel. So here we listed some differences between Wireless LAN and Bluetooth. 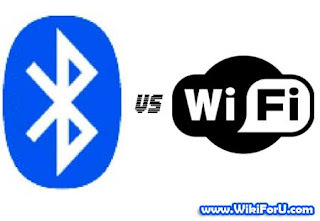 Bluetooth and Wi-Fi are different from each other in many aspects. Wi-Fi has large bandwidth which results in large speed of transfer and it also requires more power and the hardware required is also expensive. While on the other hand, Bluetooth requires very less power and very cheap hardware for it. But the range of Bluetooth is not as large as Wireless LAN and Bandwidth is also not as large as WLAN. The Frequency range used by both WLAN and Bluetooth is same but multiplexing techniques used are different. Bluetooth is often taken as Wireless USB while a WLAN is known as Wireless Ethernet. Though, Bluetooth has lower bandwidth than WLAN but its bandwidth is still larger than wires or conventional systems for which it was implemented. And the Bandwidth of Wi-Fi is obviously much larger than the conventional systems or LANs. Also Read: What Is WLAN? Those were the main differences between WLAN and Bluetooth. If you think i missed some of the differences then please let us know about them via comments so it can be helpful for other users also.